Join us from 26-28 May for a three day music, food and drinks extravaganza, in collaboration with the iconic New York City DJ – Francois K, legendary Ibizan Hotel, Pikes and Croatian festival and Love International. ‘The Electric Weekender’ is a specially curated and a celebration of all the things the illustrious Unabombers pair hold dear (namely food, drink, music and parties) from their 25 year journey, and it will see the 10,000sq foot Refuge space and outside street evolve over the weekend, including a New York loft-style party in a basement, a proper old pub knees-up with local craft beer heavyweights, an all-day Sunday Balearic soiree reminiscent of the original spirit of the White Isle in The Dining Room and Public Bar and The Winter Garden. Kicking off the weekender will be Electric Chair hero and New York demi-god Francois K, who will be returning to Manchester on Friday 28 April, exactly 20 years after playing at the now defunct Music Box just 300ft away. FK will be spinning tunes all night long in The Refuge basement, a recently unveiled space in the underbelly of The Principal Manchester, in an iconic homage to New York City between 1975-1985. From the Loft, through to Paradise Garage, FK’s set will provide a rich musical journey through soul, funk, house and disco, playing the tunes that made the era so revered and inspired what happened in clubs and music for the next 40 years. On the Saturday, the subterranean basement space will transform into an old school Manchester pub set-up, fittingly named The Refuge Arms. With sawdust adorning the floors and piano players tinkling away playing the punter’s favourite songs, this old school, boozy beer takeover will provide a day of good old fashioned pub debauchery complete with pickled eggs and cask ales and beers provided by six regional breweries including the infamous Shindigger. Saturday night will see the hotel’s outside space taken over for a ‘summer of love’ street party hosted by Love International, whose Croatian festival has won the hearts of thousands of people from all over the globe. Alexander Barck, part of the Jazzanova crew of DJs and producers from Germany, will be playing a set fusing many styles, including, acid jazz, soul and broken beat in the stunning Waterhouse Way. The Sunday will be a collaboration with Ibiza’s famous Pikes Hotel and this is the first time this illustrious hotel has partnered with anyone outside the White Isle. Programming the street with legendary Ibizan DJs, Alfredo and Leo Mass who single-handedly started the whole Balearic revolution at Amnesia. This is the beginning of a beautiful partnership that will see The Unabombers travel to Ibiza to return the favour later in the summer. Creating the flavour of the Spanish Island will be award winning Laventer, whose Ramsbottom restaurant saw them voted in the top 100 UK restaurants with huge love also coming from food critic, Jay Rayner. 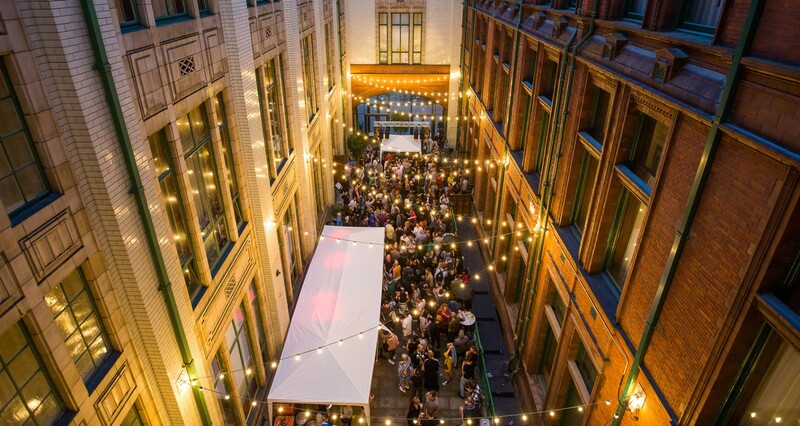 Another addition to the weekend session, will be pop-up food heroes including Robert Owen Brown, one of Manchester’s most respected and loved chefs, who will be cooking up a storm with a pop-up grill situated in the outside street space, Waterhouse Way. Luke Unabomber said: “This weekender is the culmination of a 25 year journey that has taken us from being DJs to bar and restaurant owners and festival organisers. This is so much more than a music festival, it’s about food, drink and good times. It will be exciting to see The Refuge space transform over the three days, providing an ever-changing space for the roster of talent that we have hand-selected to help us really bring the party to Manchester. Watch this space for our evolving line up and programme of events”. The weekender kicks off at 4pm on Friday 26 May and will finish late Sunday night with a closing party down in the basement. NEW TO THE LINE UP: We’ll also be running an exhibition of Justin Robertson’s art and he’ll be joining us on the decks in The Public Bar on Thursday 25 May. Tickets for the party with François K are available from Thu 13 Apr, here (priced from £12.50).